After coming to the bittersweet decision to call off the house hunting process, I still find myself dreaming about the dream home...the way it would look, the furnishings, the scent, the family that will one day fill it. When husband and I opted to put a pause on that milestone in our life, I felt my heart sink into the very bottom of my stomach. I felt sadness in giving up the possibility of being home owners in our very near/immediate future. Yet, I also felt free and weightless knowing we weren't tying ourselves down to the area. It's a strange combination of emotions to have all at once, and somehow it left me at peace with the choice we made. In deciding to step away from buying a house, I knew I didn't have to give up on my perfect home and the rooms within it that I had completely finished in my imagination. One of my favorite spaces in a home is the kitchen and the family room (okay, so I can't just pick one; two of my fave spaces). I have meticulously planned every detail in both rooms, down to the paint colors and the gallery wall of frames. It's not hard for me to envision how those rooms would turn out. Truthfully, it kind of comes naturally to me. Out of both rooms, I see the kitchen as the main hub of the house. Really, it's where a lot of time gets spent (prepping for meals, eating meals, cleaning up after meals, entertaining, having conversation), and it should be a cozy room that seems like it walked straight out of your dreams. 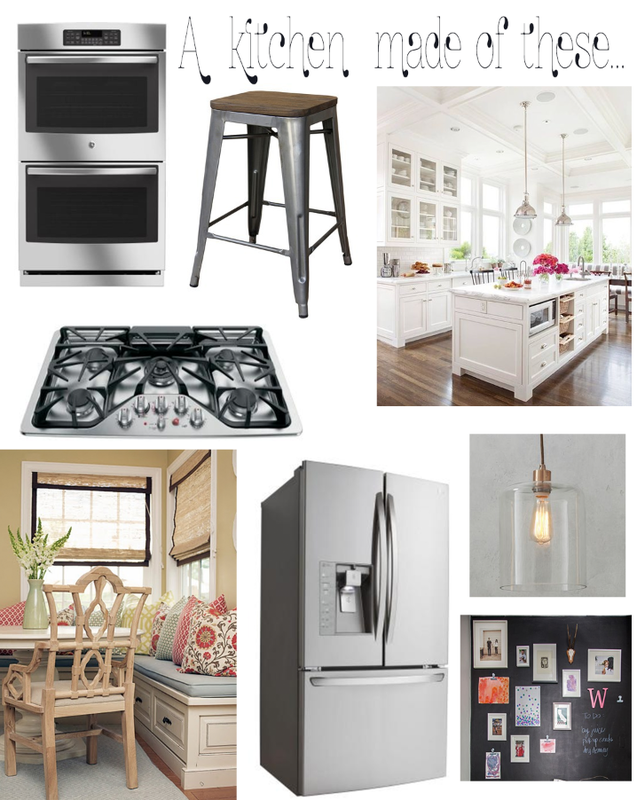 For me, I know exactly what I see in my future kitchen; it's mapped out in my head from floor to ceiling. Easy. Let me paint you a picture. The countertops would be a white quartz (durable and not so porous) and they would be placed upon white cabinets. The white subway tile backsplash would lead up to the bottom of the white hanging cabinets, and the recessed cabinet lighting would shine a brilliant white glow onto the countertops. An apron-front, farm sink would rest under a large, rectangular window, that I would be looking out of to watch my children play. The island in the center of the kitchen would host stools for little ones to sit on while I bustled around the natural maple hardwood floors. Can you see it?? Of course appliances are what make the kitchen, at least in the way of cooking. The stainless steel, bottom-freezer, double-door, refrigerator would be nestled amongst the white cabinets. And atop that beautifully wide and rectangular island would be the six-burner, gas stovetop. (Drooling, yet?). A dishwasher would be of the upmost importance too, and snuggled amongst those (yes, white) cabinets you would find one in the smoothest satin of stainless steel. My absolute favorite appliance would be the double ovens so perfectly placed in the wall. And not just double ovens featuring one oven smaller than the other. No, equally sized, stainless steel wall ovens perfect for cooking huge holiday meals in. Complete the look with a lovely KitchenAid mixer to grace the counter space (how I don't have one of these yet is still a mystery). I can't forget to mention the kitchen accessories that would bring the room to life, like the fresh flowers on the eat-in kitchen table that would host a few chairs and built-in benches. There would be all-glass, pendent lighting hovering above the island and four accompanying stainless steel stools. Photos and wall prints boasting with cheer would adorn the walls, and the herb garden would be thriving in the huge, sunlit window. These are just to name a few. I could go on and on about how much I want my kitchen to look just so. About every little detail that I want to pour my soul into. Sometimes I think my calling was interior design (I did start my college years out with the intention of being one), but maybe I'll stick to writing and keep the designing to my own home. I think it's probably easy to guess that I can't wait to put my touches on a home one day. I'll keep dreaming until then. Do tell, what is it you see in your dream kitchen? ?